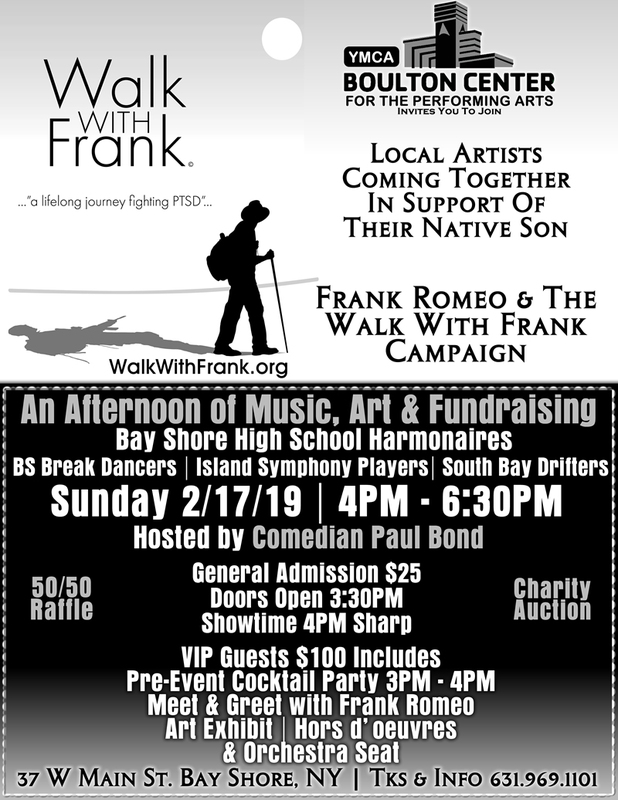 Join us at “The Boulton Center for the Performing Arts” for a unique fundraising event of music, comedy, dance, art, raffles, and giveaways as Bay Shore comes together to celebrate and launch the Walk With Frank campaign. Opening with the National Anthem Bay Shore High School’s “Harmonaires” will remind us of our roots and lead us into the future. Break Dancers, classical string quartets, and the rock band “South Bay Drifters” led by David Goetz will be introduced and taunted by our one of a kind Comedian Musician Host Paul Bond. Join us for a pre event VIP Cocktail Party and art show in the lounge to enjoy complimentary food and drink. MEET AND GREET with Frank Romeo artist, educator, and veteran advocate and share his journey as we wish him well. Tickets can be purchased either through the Walk With Frank website or The Boulton Center. WalkWithFrank.org and click “please donate”. Be sure to leave you name. Thank you for serving the American people. You are an anchor of hope.